Wood floors, in particular hardwood, are all the rage in home décor these days. Their stunningly handsome appearance and hypo-allergenic nature make them a sought-after choice for every room of the house. But how do you keep them looking great? Here are 12 tips for cleaning your wood floors – the natural way. 1. Regular maintenance. Every day or two, go over your floors with a broom or the hose attachment of your vacuum cleaner to pick up surface dust and dirt. 2. Dealing with pet hair. Even short haired pets can shed a great deal. Brush your four-footed friends outdoors in your yard or on a balcony if possible, especially in spring and early summer. I find that gently brushing my dog from tail to head is the best way to get rid of loose hair. 3. Spills. Speaking of pets, it’s important to clean any pet accidents off your wood floors ASAP, as well as all other spills. Left alone, these can ruin the finish and perhaps leave a lasting stain in the wood itself. Blot liquids up with a microfiber cloth or cleaning rag. 4. Water. Wood’s natural absorbency means it expands when wet, which may result in warping and splitting. Even plain water has tremendous potential for damage. Minimize floor washing and choose your method and tools carefully. Never EVER just slosh a bucketful of water all over your floor. Avoid sponge mops and other types that cannot be thoroughly squeezed out. 5. How to wash. Damp mop with a minimum of liquid. Or wash your floor the old-fashioned way, on hands and knees. This permits you the most control over the amount of water you’re putting out there. Never leave puddles. Instead, buff the floor with a dry cloth immediately after washing. 6. Vinegar. 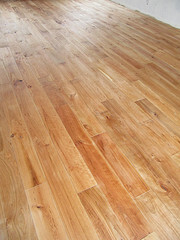 Many homeowners recommend using a vinegar and water mix as ideal for cleaning wood floors. Lemon Grove flooring pros advise that because vinegar’s high acidity can actually harm your flooring’s finish, it should be highly diluted prior to use. And vinegar should never be used on waxed wood. 7. Tea. Black tea is suggested by some homemakers as a natural cleaning agent for medium to dark hardwood floors, as well as laminates. Steep a bag or two in boiling water. When it’s cool, moisten a cloth in the brew to wash the floor. I just tried this on my laminate flooring with good results. 8. Buyer beware. Using vinegar, tea or any other product not specifically approved by the floor manufacturer will void your warranty on new wood flooring. Be warned. 9. Sanding. If your wood or hardwood floor has become permanently stained or damaged, you may need to sand in preparation for refinishing. This can be quite a major project, especially if you choose to DIY. On the other hand, it is less expensive than replacing the flooring completely. 10. Scuff sanding. Damage to the finish alone, which does not affect the wood, can be treated relatively easily by scuff sanding with an electric buffer. 11. Sanding dust removal. Be careful to remove all dust left behind after your sanding job before applying the new finish. 12. Natural refinish. For an eco-friendly refinish, choose one of the plant-based oils on the market. Make sure it is from a sustainable source and is non-toxic with no VOCs. Another option is a clear coating made from recycled whey protein, a renewable resource very low in VOCs.